Fauré's Nell from his 3 Songs, Op. 18 has been arranged for viola solo and piano by the world-famous violist Donald McInnes, who held a professorship at the University of Southern California from 1985 to 2014 and is known in virtually every corner of the artistic world for his appearances with major orchestras, recitals, chamber music participation, and numerous master classes. Nell is the first song from the Op. 18 set by Gabriel Fauré. Like Lydia, it is based off on a poem by Leconte de Lisle. Written in 1878, it features an entrancing melody, rich harmonic texture, and depth of feeling. It also features a quasi-Scottish subsection that includes the poems Jane (set by the young Debussy), Nanny (set by Chausson) and La fille aux cheveux de lin (made into a piano piece by Debussy). 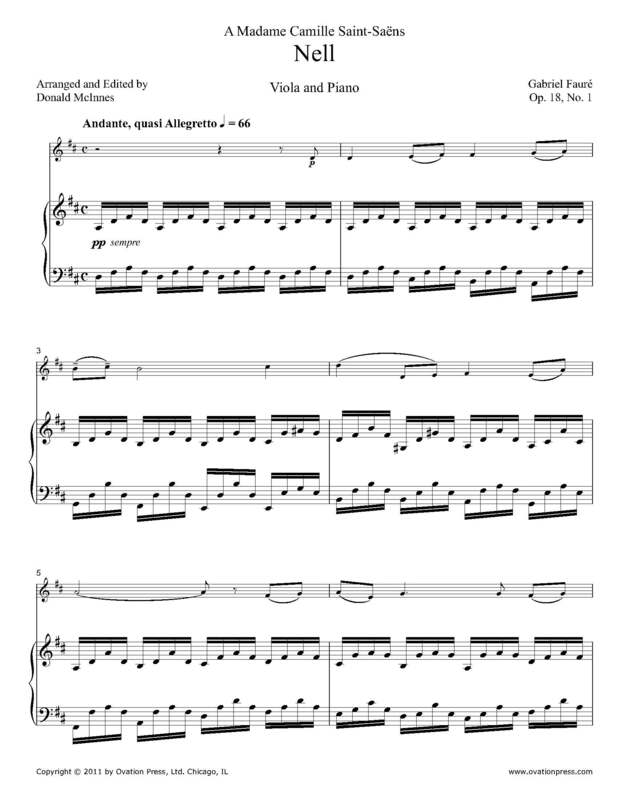 Download and print the score today to gain access to this expertly edited arrangement of Fauré's Nell for viola and piano by Donald McInnes! Click here to listen to a recording of Donald McInnes performing Fauré's Nell arranged for viola and piano. your red, red rose sparkles ecstatically. my heart resembles your rose. singing their love-songs (oh my heart!). the star of pensive night!